The Caldwell County Family Violence Task Force is a collected effort among local agencies and individuals dedicated to creating an environment where violence and abuse are not tolerated in our community. The Task Force works to promote activities in the areas of education, public awareness, and coordination of services. 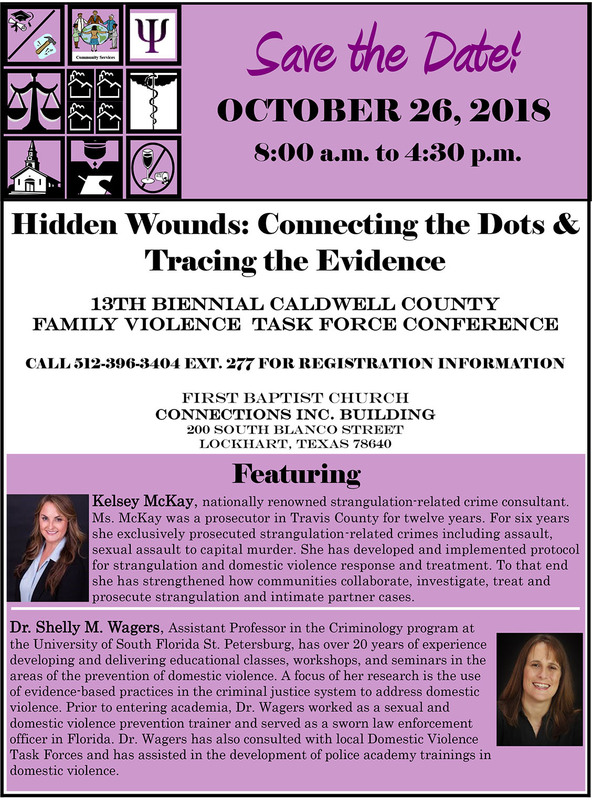 This is the 13th Biennium Professional Education Conference put on by the Caldwell County Family Violence task force, which is now in its 22nd year of community service for family violence intervention and prevention. This year the conference will be held on Friday October 26th at the Connections Center Building located at 200 South Blanco Street in Lockhart. Registration is open and the cost to attend the one-day conference is $75 which will include snacks, a catered lunch, beverages and dessert. Please refer to the attached flyer that gives you more specific information regarding the speakers who are both well recognized for their work in Texas and nationally. Continuing education credits will be available for Law Enforcement, Probation, Counselors, Marriage and Family Therapists and Social Workers. Of course, anyone can benefit from attending the conference. At every conference the Task Force gives awards to honor three people in our community who have done an exceptional job of helping victims of family violence in Caldwell County. These awards are presented to the individual at the Conference. We hope that you will consider taking advantage of the opportunity to participate in a conference with Nationally known and respected experts in their fields.